Can you see the 3 beasts depicted on the buckle? The magnified close-up images lower down the page may help you see the detail. 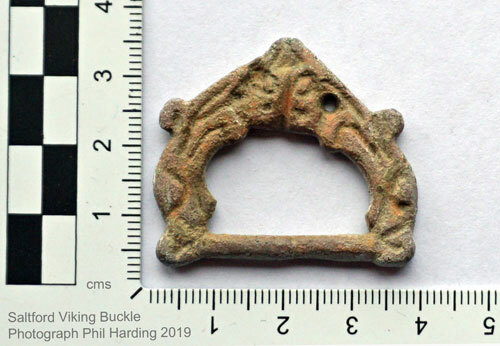 This bronze 11th Century Viking Buckle (length 33mm, width 38mm, thickness 4mm) was found on the north side of Saltford in 2018, quite close to St Mary's church. Described as a very rare find for this area by the Gloucestershire and Avon Finds Liaison Officer, it is classified by the British Museum as a "Find of note and of Regional Importance". Quite how it got to Saltford is difficult to know but you can read a brief article lower down this page about 'Viking Rule & Saltford'. Copper alloy D-shape buckle that has a complex moulded frame. The front of the buckle is expanded to form a sub-triangular panel that has a moulded animal head on the top with hollowed circular ears, lentoid eyes below and a triangular snout forming the forward edge. Flanking this and forming the curving sides of the buckle is an arching beast on each side that face back towards the strap bar. The neck of each beast emanates from the side of the first facemask and is decorated with two recessed lines that run halfway down its length to the head. Behind the head and on the outside edge of the frame is a curving projection that forms the ear of the beast. The face is decorated with large lentoid eyes, line below for the mouth and long snout with a recessed bulbous terminal for the nostril. Below the snout in the narrowed strap bar that is gripped in the mouth of both the side beasts. 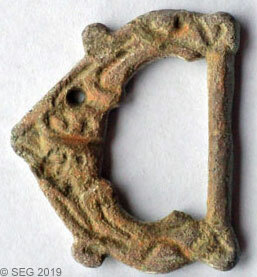 This buckle is in the ringerike* style, a similar example, found in London from the Thames, was dated to the 11th century (Wilson, 1964, 143-144). The ringerike style was a Scandinavian animal style from the late 10th C & 11th C.
Viking Buckle found by Bob Mordle in 2018. 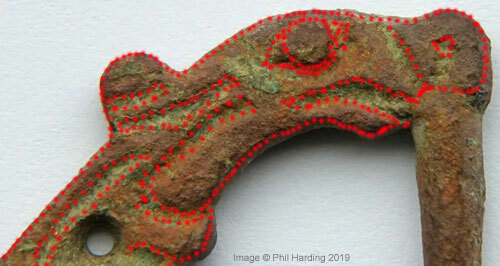 Portable Antiquities Scheme: https://finds.org.uk/database/artefacts/record/id/925218/ (2019). The magnified image above shows the detail of one of the two larger side beasts (dragons/serpents?) facing right (projecting ear on the left, bulging eye is centre and its snout with nostril to the right - it is grasping the strap bar of the buckle in its mouth). We have added a red outline to help depict the main elements of the beast's head. The magnified image above shows the face mask of what appears to be an animal (wolf? 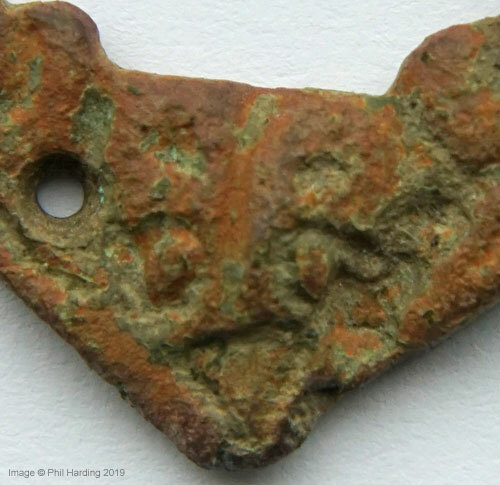 ), bird or serpent looking straight ahead (with its mouth/beak open or is that a triangular snout..?). "Then went King Sweyne thence to Wallingford; and so over Thames westward to Bath, where he abode with his army. Thither came Alderman Ethelmar, and all the western thanes with him, and all submitted to Sweyne, and gave hostages. When he had thus settled all, then went he northward to his ships; and all the population fully received him, and considered him full king. The population of London also after this submitted to him, and gave hostages; because they dreaded that he would undo them." 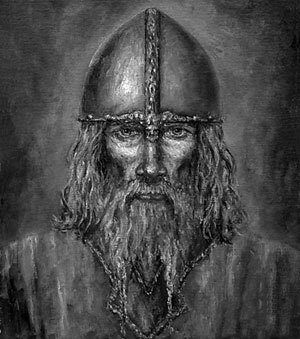 Sweyn Forkbeard, the first Viking King of England, ruled England for only 5 weeks from Christmas Day 1013 until his death on 3rd February 1014. The son of Harald Bluetooth, Sweyn was a brutal and violent warlord, he was never crowned and hence is often forgotten. He was the father of Cnut (Canute). Viking rule of England recommenced under Cnut (Canute) in 1016 after a brief period of Anglo-Saxon rule by King Ethelred II the Unready who returned to the throne in 1014 until his death in 1016 and a brief period in 1016 under the rule of Edmund lronside. Cnut (Canute) ruled England from 1016-1035 and was succeeded then by his son Harold Harefoot (aka Harold I Harefoot) and then Harold's brother Harthacanute in 1040, the last Scandinavian to rule England, until the Anglo-Saxons resumed power under Edward the Confessor in 1042. Anglo-Saxon Chronicle (translation by Rev James Ingram, 1823). The Vikings (Old English: wicin meaning pirate) were Norse seafarers, mainly speaking the Old Norse language, a North Germanic language, who during the late 8th to late 11th centuries, raided and traded from their Northern European homelands (that is modern Norway, Sweden and Denmark) across wide areas of Europe, and explored west towards Iceland, Greenland, and the area of coastal North America. The Viking Age period of Nordic military, mercantile and demographic expansion is an important aspect of Britain's early medieval period. Vikings have a reputation for being bloodthirsty, ruthless raiders, but they were not all like that. Some came to fight, but others came to Britain to live a peaceful existence. They arrived with their families in longships and settled in villages. There were farmers, who kept animals and grew crops, and skilled craft workers, who made attractive metalwork and wooden carvings. Families lived together in a large home called a longhouse. 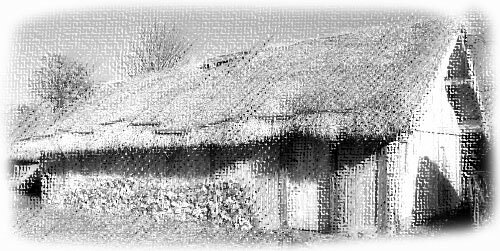 Longhouses were made of wood, stone or earth and turf, the latter was more effective in keeping out the cold. The Vikings brought with them their way of life and beliefs. The Norse people worshipped many gods and had a fascination for magic and monsters, such as dragon-like serpents. Viking farmers had a tough way of life. Everything had to be done by hand on a Viking farm; most farms kept slaves who worked alongside hired workers. They grew oats, barley, wheat, and vegetables and made flour, porridge and ale from grinding grain. They kept livestock such as cows, sheep, pigs and chickens. The craft workers made the things villagers needed for everyday life. Woodworkers and leatherworkers made plates, cups, belts and shoes. Jewellers (metal workers) made rings, brooches and buckles. Blacksmiths hammered and twisted red-hot iron into tools, knives and swords whilst potters made clay pots in ovens heated by firewood. These goods were taken to market to sell where families could buy their provisions. Viking traders also sold their goods overseas. They travelled overseas in their longships to purchase and bring back home silver, silk, spices, furs etc.